In circa 1875 Wilhelm Konrad began a furniture business along with a Mr. Wolf. As a side business, Mr. Konrad operated a funeral parlor in a back room of the furniture store. In the cases of a funeral from decedent's home, the furniture store would provide chairs and arrange for the hiring of hacks (carriages) for the transportation of family and friends to the place of burial. As our society changed from a rural to more and more urban the homes of most people became inadequate for funerals. The funeral home, as we now know it, evolved as an alternative home from which families could hold wake services for their loved ones. As public health and safety became more recognized, funeral homes became more and more specialized in the facilities and services that they offered. In 1932 the Konrad Furniture Co. split its furniture and funeral businesses into two separate enterprises. The funeral operation moved to its current location on Waugoo Avenue into a larger home that was extensively remodeled. In 1958, George Konrad, his sons, William and Fred Konrad and a nephew, Lawrence Konrad reincorporated under the name Konrad Funeral Home, Inc. which it remained until 1983 when it was reincorporated as Konrad-Behlman Funeral Home, Ltd.
With the continuous growth of the city of Oshkosh to the west, the business opened its second location on the west side of Oshkosh in 1994. In 2001 the funeral home added an on-site crematory to better serve the community. 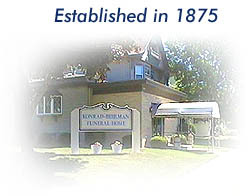 Being in business for over 140 years, the Konrad-Behlman Funeral Home has served more families in Winnebago County than any other funeral home and is the second oldest continuously operated business in the county. We attribute this to our tradition of caring, compassionate service and fairness regardless of our customer's financial situation.